The Ceibal English (Ceibal en Inglés) is a project involving language teaching via video-conferencing in Primary schools throughout Uruguay. As it develops, expanding from 500 to 1,000 classes a week in 2013, and doubling again to 2,000 classes a week in March/April 2014, I am recording and relfecting on different aspects of the project. This page lists all of the blog posts I have written about the programme. Remote teaching, distance learning, team teaching or blended learning? When adopting or adapting technology for effective teaching and learning, it often helps to use a framework. One such framework, produced by Dr. Tony Bates, Research Associate for Contact North, is SECTIONS, devised by the University of British Columbia, and mentioned in Planning for Effective Teaching with Technology, part two of the great series of articles Understanding the Building Blocks of Online Learning. Rather than just designed to be used at a teacher or classroom level, this framework has been devised "facilitate decisions with regard to choice of technology at both the strategic and the tactical level". 1. Define what you are trying to accomplish by answering a series of questions about what you want to achieve. 2. Assess by using a checklist to evaluate the technology you have chosen to investigate or use. What didn't work and why? 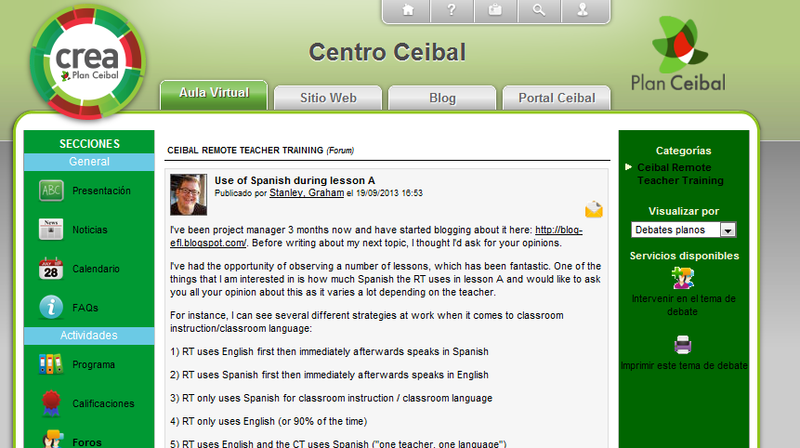 One of the issues we have been discussing in the Ceibal English project is the use of L1 by the two teachers- the CT (classroom teacher) and the RT (remote teacher), and after observing a great number of classes, I can see this varies a lot. Teachers attitudes to using L1 in the classroom varies a lot. I remember when I first started my teaching course, I was told that this was to be avoided at all cost, but when I started teaching young learners I realised that some use of L1 was necessary - mainly to save time and for classroom management reasons. There are some very interesting posts about this. In particular, I encourage you to read what Scott Thornbury wrote on his blog about translation (and the comments!) and the response by Isabela Villa Boas. I have heard from some of the RTs that they believe they need to use more Spanish than they would usually do in an English classroom because of the lack of English knowledge of most of the CTs. However, some of the teachers involved in the project, who are based in the Philippines, and who have limited ability to speak Spanish, are in general teaching their classes without speaking any Spanish (in most of the cases) and there have not been any complaints from CTs. I've now had the opportunity of observing a number of lessons, which has been fantastic. One of the things that I am interested in is how much Spanish the RT uses in lesson A and would like to ask you all your opinion about this as it varies a lot depending on the teacher. 6) RT started using mainly Spanish for the classes, but is moving towards more English as the CT and the children learn more. Which of these do you think is best? Which do you use? Do you use different strategies depending on who you teach? 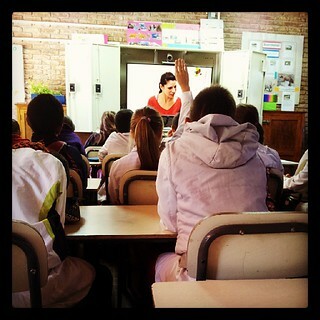 Does the fact that this form of teaching is very different from normal classroom teaching affect your opinion on this? We are now looking at producing guidelines and will be working with RTs to reduce the amount of Spanish used in class, but I'd be very interested in hearing what others think about this.